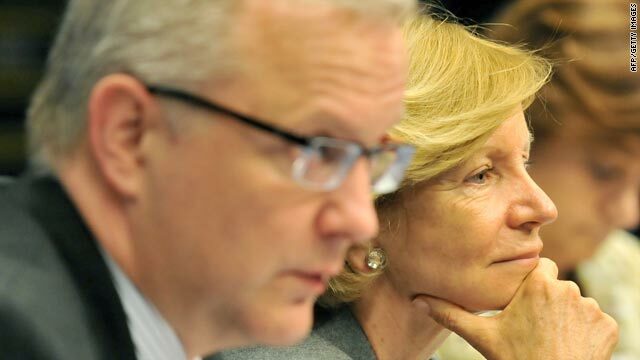 Olli Rehn of the EU, left, and Spanish Finance Minister Elena Salgado speak to reporters early Monday. (CNN) -- Europe's finance ministers approved in an emergency meeting late Sunday a "stabilization mechanism" that could provide at least 440 billion euros (US $560 billion) for a crisis aid package aimed at ensuring financial stability across Europe. The deal comes after a week of heavy stock market losses for some of the European Union's member states in the wake of a massive bailout for Greece's battered economy. 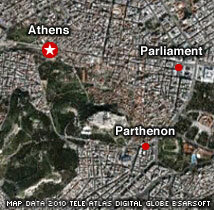 The ministers, meeting in Brussels, Belgium, sought to ease markets shaken by the Greek economic crisis before they re-opened Monday. Under the deal announced early Monday, the International Monetary Fund could provide up to 220 billion euros (US $280 billion) to the crisis fund in addition to the EU's contribution of 440 billion euros, Spain's Finance Minister Elena Salgado said. Another 60 billion euros (US $76 billion) would be available should member states experience "exceptional occurrences" beyond their control, Salgado said. Will the EU aid package work? Olli Rehn, the European commissioner for economic and monetary policy, praised the deal early Monday, saying "the fiscal efforts of European Union member states, the financial assistance by the (European Commission) and member states, and the actions taken today by the (European Central Bank) proves that we shall defend the euro whatever it takes."